útúrdúr: Publication of "Snake Cool and The Cobra Crazies"
Publication of "Snake Cool and The Cobra Crazies"
Sigurður Þórir Ámundason mun fagna útgáfu á sinni fyrstu ljóðabók ,,Snake Cool and the Cobra Crazies" næstkomandi föstudag 18 júni frá 16 til 18. Í tilefni af útgáfu bókarinnar mun Sigurður einnig sýna nokkur ný málverk og Two Lonely DJ´s munu þeyta nokkrum skífum og léttar veigar verða á boðstólnum. Sigurður er nemandi í myndlist við Listaháskóla Íslands og málaði hann til að mynda vegginn STIGIS við Hjartagarðinn í Reykjavík. 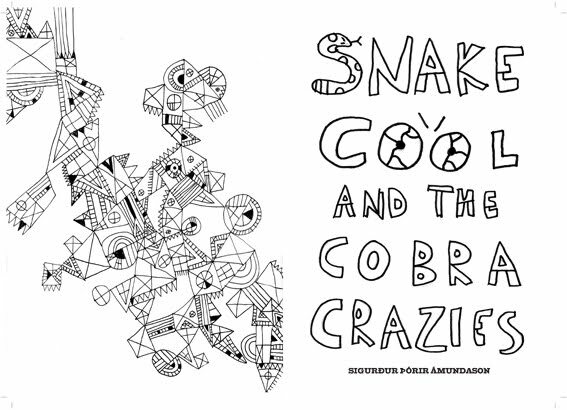 SIgurður Þórir Ámundason will celebrate the publication of his first poetry book "Snake Cool and the Cobra Crazies" at Útúrdúr from 16-18 on the 18th of June. Sigurður will also show some paintings that he has been working on and Two Lonely DJ´s will play during the opening. Sigurður is a student at The Iceland Academy of the Arts and to mention some of his earlier works he painted the wall STIGIS at Hjatargarðurinn in Reykjavik.